Cham Yean grew up in a poor family in the small country of Cambodia in the 1960s and 70s. During this time, Cambodia was in the midst of a civil war, and bombs would drop frequently, without warning, and kill many people. Because of this, Cham had to live her daily life amidst the fear of whether she would make it or not. In high school, she had to copy down the lesson from the board, getting little help to learn the material. Life was hard, but by the end of high school Cham got the opportunity to go to college, which was very rare. At the time, the only location for college in Cambodia was in the country’s capital, Phnom Penh. Cham went, and after a year, she was going to two schools, one in the morning, and one in the afternoon. Since her family was poor, the plan was that after she got her bachelors, she would become a school teacher in order to support her family. In her second year of college, 1975, the Khmer Rouge, a communist regime, took control of Cambodia’s government. The Khmer Rouge’s ideology dictated that Cambodia had had too much help from western civilization, and Cambodia needed to start from the beginning again. They got rid of intellectuals, school, and personal belongings. Cham was forced to leave college, go to a random location in the countryside, and work under harsh conditions in rice fields. This period of time lasted for four years, and during it, the Khmer Rouge killed anyone under the suspicion of being against the regime or its ideas. During this period of time, Cham and two of her friends made a risky decision; They decided to leave. They fled on foot with only one or two pairs of clothes, a blanket, and a head covering for the perpetual rain. They were heading for Thailand, but they didn’t know if they would even be permitted there. They also had to continually hide from anyone who might catch them during their trek to Thailand, and hiding was difficult while traveling on foot. Miraculously, they made it to Thailand, but the Thai government didn’t want them there. They stayed anyway, hiding with other immigrants in the jungle on the border between Thailand and Cambodia. They spent a month in the jungle, foraging for whatever food they could find. By that time, Thailand had taken control of Cambodia’s government and help became available to the immigrants living in the jungle. No longer feeling that Cambodia was safe, Cham applied with her friends to a refugee program to come to the United States. They were accepted, and they boarded a plane to America. They first landed in Oakland, California, and Cham remembers thinking it was like heaven. She felt lucky even to have gotten on the plane and out of the jungle. From Oakland, they took another flight to Chattanooga, Tennessee. A church there had volunteered to take refugees, and the three of them stayed with the pastor for a month. Cham discovered that there was running water, that she could plug things into the wall to make them work, and that she could use a telephone to call people. The pastor had Cham and her friends eat food they were unused to, like sandwiches, and it was okay, but they wanted to eat rice and fish like they had in Cambodia. After staying with the lady for about six months, she moved to San Jose, California, to stay with a man she met through a friend, but it didn’t work out, and she was left living on her own with a baby. The first job she got was on an assembly line making computer chips. Knowing she needed a better job though, Cham attended a one-year school program to become a technician and afterward got a job fixing oscilloscopes, a piece of equipment for measuring electricity. Cham then went back to college; she hadn’t gotten the chance to finish college in Cambodia, and she wanted to do so in the United States. Unfortunately, now having two kids to raise, and having to work, Cham only got an associates degree in college. 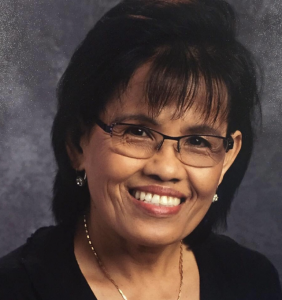 Not able to bring her education to where she wanted, Cham encouraged her children to do well and get a good education, telling them to not give up the chance they had. They took different paths, but Cham feels like they ended up pretty okay. This story was written by Ben Erickson, a student at Palo Alto High School.